Villa Semeli is a pleasant 3 bedroom, 3 bathroom property located in the heart of Coral Bay with shops and restaurants on your doorstep! The popular sandy beach is also a short walk away. The villa is a great choice for families or small groups who prefer not to hire a car. The house has a spacious pool terrace and is airy inside. Air conditioning/heating in all bedrooms, a heated pool and WiFi are included. Location! Location! Location! The villa is within walking distance to shops, restaurants and the beach. Perfect! The large pool is on the one side of the villa with plenty of space for sunbeds. The terrace is at the rear, where you can find a dining table and chairs - perfect for dining alfresco. The brick BBQ and games tables are also here for your enjoyment. The living area is open plan incorporating a bright and spacious lounge. The dining area is next to the well-equipped kitchen. There is also a patio window, looking out to the sun terraces, which brings more light into the room. All 3 bedrooms are spread over the first floor. The double bedroom has an en suite shower room and a balcony with views over the popular Coral Bay resort. There are also 2 twin bedrooms, one of which has a balcony, as well as a separate shared bathroom. There is a further shower room on the ground floor. 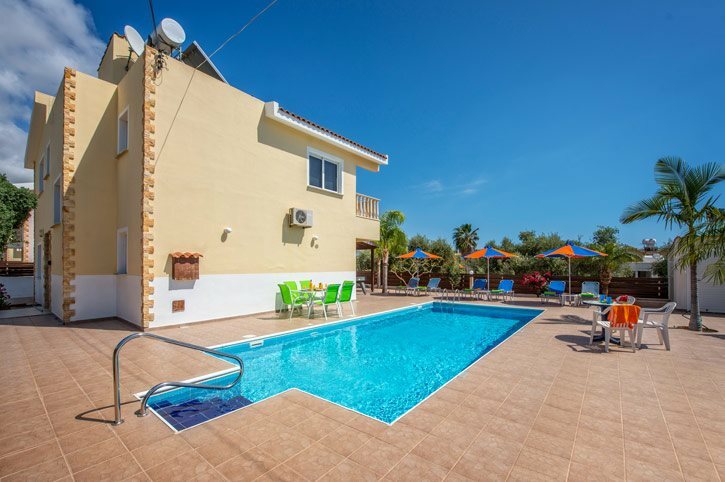 The villa is situated in a residential cul-de-sac and is only a short walk from the centre of Coral Bay. The beach is also within walking distance. This villa is ideal for those who wish not to hire a car. Villa Semeli is located next door to our villas Coral Athina and Pandora and is ideal for families or groups who wish to holiday together but retain their own privacy. This Cypriot villa is superbly situated close to the Coral Bay main strip with all the shops and retail outlets on your doorstep - everything from designer spectacles and unique jewellery to souvenirs and trinkets. The bustling town of Paphos is famous for its market and you can reach it by bus or in 20 minutes by car or a bus. It has a market which is set in a maze of lanes selling an array of Cypriot fare including the local Cyprus linen and lace. There is also a farmer's market in the old town of Paphos. At weekends, you can buy fresh fruits and vegetables, as well as items such as lace, leather bags, olive oil products, souvenirs and other local items. The building of the King's Avenue Mall has all of the top shops in one place. The Coral Bay resort strip caters for those seeking bars, cafes and restaurants. It is great if you want to sample Cypriot dishes in local tavernas or even if you are looking for international cuisine. A short drive uphill guides you to the heart of Peyia. There are a number of traditional tavernas with excellent local fayre. Coral Bay beach is walking distance from the villa. It also has sun loungers and parasols to hire and is the place to head for water sport thrills. Head east for Paphos Old Town and its maze of narrow streets or go to Kato Paphos (the harbour). This is home to some of the most intricate mosaics in the Eastern Mediterranean and has numerous activities to enjoy, a variety of bars, restaurants, shops, the water park and nightspots to entertain. Whilst on your Cyprus holiday, visit the Akamas Peninsular, which is the perfect place for a hiking trip. The view from the top is amazing! A rocky path leads through Aphrodite Baths, where the Goddess of love used to shower. The path is very rocky, that's why comfortable shoes are necessary. A walk through the entire park can take a whole day or even a few if travelling slower, because there is so much to see! Villa Semeli is not available to book for season as it is sold out. Take a look here at the Cyprus villas that are currently on sale. St George is a tiny fishing harbour which has a sheltered bay with gentle slopes of sand and small pebbles directly into the sea. On hand is a small beachside bar. There are no toilet facilities although some can be found uphill at the nearest taverna. NB: You can not swim at this beach due to safety restrictions. We had a fantastic family holiday in a beautiful Villa. Very well equipped and very clean and tidy. Close to the resort, but far enough away not to be too noisy (big bonus with small children). The Villa was located down a private road with a dead end, so no through traffic. The kids loved the pool, pool table, table tennis and wifi for their tablets. Brilliant staff members Villa Plus (please pass on our sincere thanks and appreciation) and make sure you retain them, as it is your people and your service that is your biggest strength. This is the 5th Villa we have booked through Villa Plus and we will be back again!!! Many thanks. Fab! everything you could possibly want or need for a perfect holiday. Villa lovely, Julie the rep great and maid service and pool guy brilliant! This is the third villa we have hired from you. The villa was excellent and compliments to the cleaning staff who were brilliant – they were very thorough. I would, however, recommend this villa to anyone – it was very quiet and at the end of a cul-de-sac, but near enough to all the life of Coral Bay itself. The heated pool a sheer luxury! We are very please with Villa Plus and recommend your company to everyone. I even told people on the plane home! We all had an excellent holiday. Loved the pool to cool off and we all enjoyed playing pool and table tennis. It was the best family holiday we have had in years. Thanks to all concerned. A very nice villa and pool. We will use Villa Plus again. The quality of the villa and service provided by Villa Plus was excellent. I would book through you again and have already recommened you to other family and friends, who have also booked villas with you this year. We had a fantastic time, Tom was great when we had a problem with the safe, arrived in minutes & the owner straight afterwards. Tom was friendly & infomative without being intrusive. Loved it!